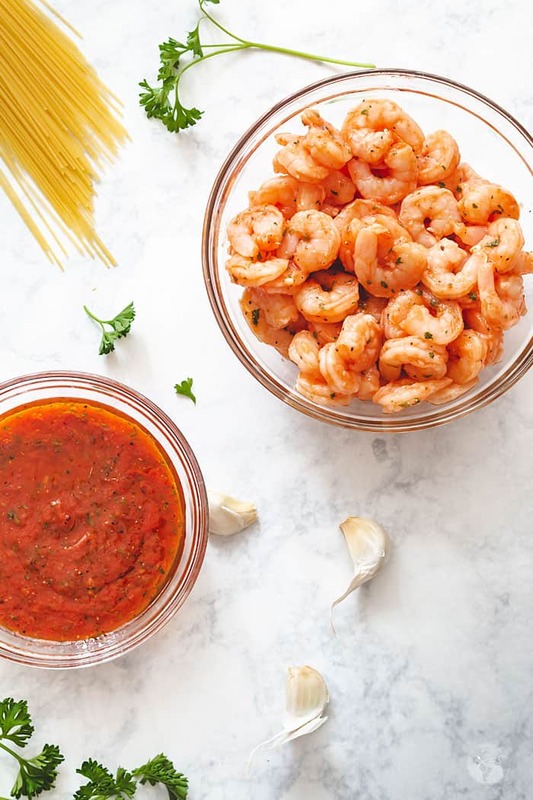 This recipe for marinated spicy shrimp scampi sounds fancy and complicated. But happens to come together easy enough using fresh or frozen shrimp. 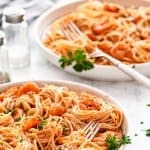 This shrimp scampi recipe is one filling and extremely delicious meal your whole family is sure to love! NOTE: This recipe was originally posted in 2015. It is completely revamped with new images and recipe tips to make cooking this dish easier for you. My husband loves SHRIMP. He would eat them every day if we could. And I gotta tell you, I’m not really a big fan of shrimp. Research shows that it takes up to ten tries of new food to decide if you like it or not. I tried shrimp more than ten times and it’s still a big NO. Not sure if it’s their texture or look or the combination of both. 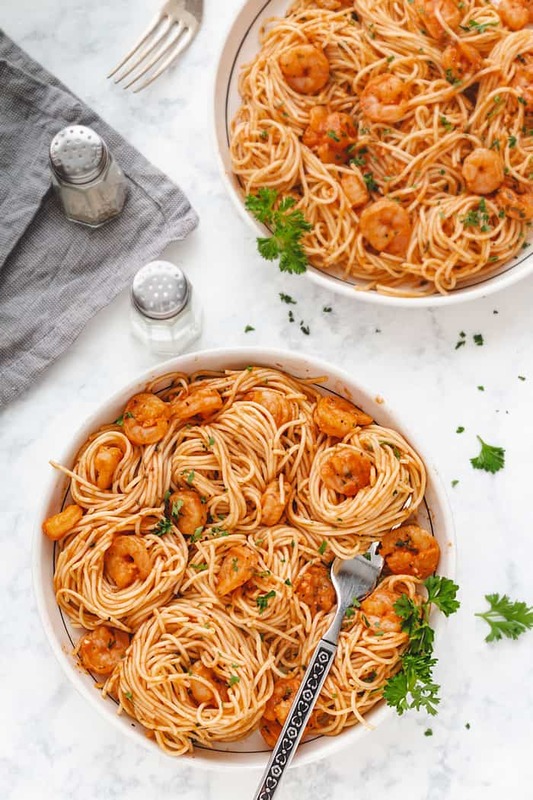 But because I love my husband (on most days), I occasionally make him a shrimp dish like this Spanish garlic shrimp that is actually an appetizer but can easily be served as a full meal for one lucky person. 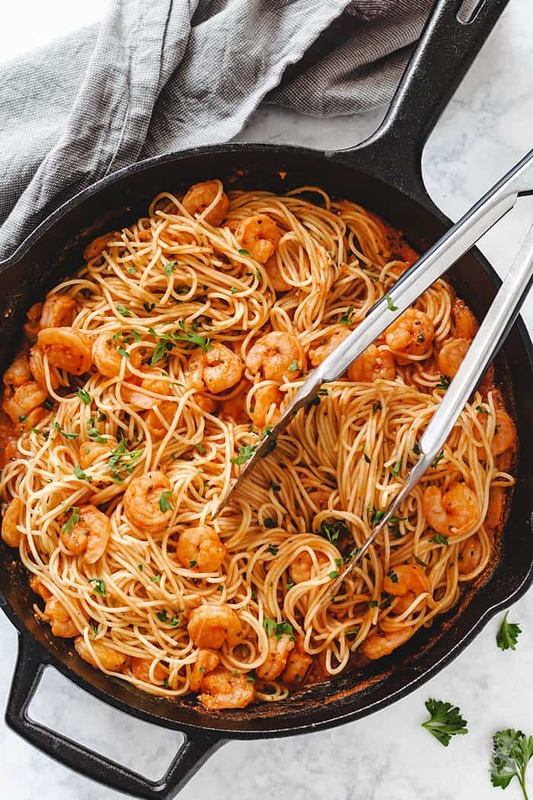 In the United States, “shrimp scampi” is the menu name for shrimp in Italian-American cuisine (the actual word for “shrimp” in Italian is gambero or gamberetto, plural gamberi or gamberetti). 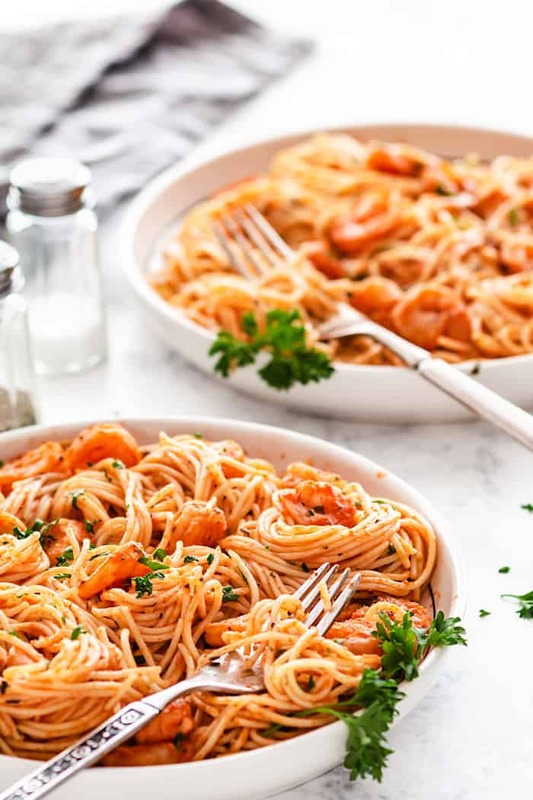 Most variants of the “shrimp scampi” come on pasta. Rinse and clean the shrimp. If you’re using frozen, defrost before using. Place in a medium bowl. Mix together the first 10 ingredients in a small mixing bowl. Measure 1/3 cup of the sauce and pour over shrimp. Marinate refrigerated for at least one hour. Reserve the remaining sauce. Add the pasta to a large pot of boiling salted water and cook until al dente. Refer to package directions for the cooking time. Meanwhile, heat a large skillet over medium heat. Add marinated shrimp and sauté until just cooked through about 3-4 minutes. Add the reserved marinade and cook, stirring to combine, for about 5-8 minutes. Remove from the heat. Drain the pasta, add it to the skillet and toss. Adjust the seasonings with salt and pepper, to taste. Sprinkle with chopped parsley and serve immediately. You can use fresh or frozen shrimp for this recipe, just make sure to defrost the shrimp first. Also keep in mind if you’re using frozen cooked shrimp, you don’t need to cook it at all. Marinate it and just add it to the sauce to heat it through. If you cook shrimp too long, it tends to get tough. The sauce used to marinate the shrimp is super delicious and can be adjusted for spiciness. I pick the shrimp out and eat the pasta alone, it’s that good. Even your kids will love it. I urge you: don’t skip the marinade step. It really gives the shrimp lots of garlicky flavor and sets this apart from other scampi recipes. 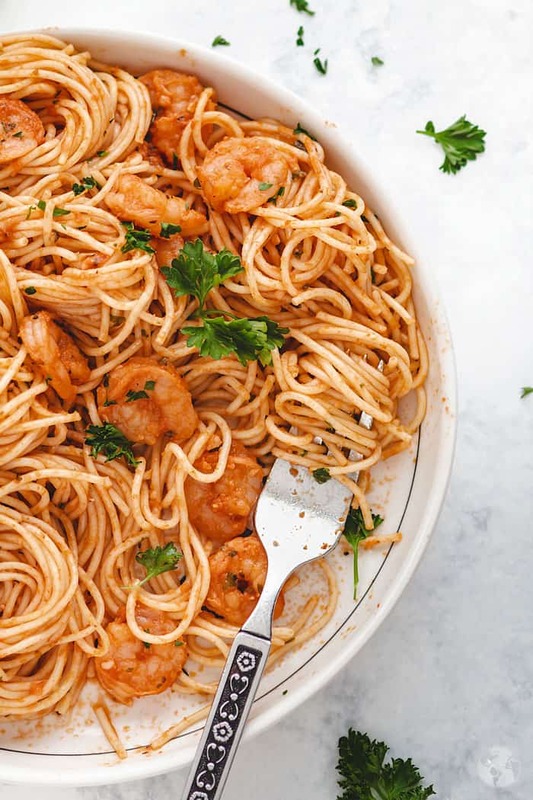 Tickle your taste buds with this spicy shrimp and pasta dish that will leave you full and satisfied. Rinse and clean the shrimp. If you’re using frozen, defrost before using. Place in a medium bowl. Mix together the first 10 ingredients in a small mixing bowl. Measure 1/3 cup of the sauce and pour over shrimp. Marinate refrigerated for at least one hour. Reserve the remaining sauce. Meanwhile, heat a large skillet over medium heat. Add marinated shrimp and sauté until just cooked through, about 3-4 minutes. Add the reserved marinade and cook, stirring to combine, for about 5-8 minutes. Remove from the heat. To intensify the flavor grill the shrimp instead of sautéing them. Add more hot sauce if you like it super spicy. This recipe is featured on Share Your Style, The Pin Junkie, Art Decoration Crafting, City of Creative Dreams, and Talented Tuesday. I love shrimp! this recipe looks stunning. I would have to replace with gluten free pasta, but can’t wait to give this easy and delicious recipe a try. Gorgeous photos BTW so pinning! Jas this looks amazing!!! And such beautiful pics! I can so see why it was pinned so many times. And it will be pinned one more time by me. My family loves shrimp and anything spicy so I will be trying this one for sure. Thank you for linking up to SYS this week and enjoy the rest of your weekend! Hi Barbara! Glad to hear that this is liked by many. Thank you bunches! This looks AMAZ-ing!! I’ve pinned it to try this Spring, ya know? When all the snow is gone? I hear ya Laura! I’m ready for Spring too…..well, been ready since September, LOL. Thanks for stopping by! This looks like something my husband would LOVE!!! Thanks so much for linking up with Waiting on…Wednesdays! Hope to see you back next week! I hope you make it for him. It’s super easy too. See you next week. So delicious! Thanks for linking up to Funtastic Friday. Hope you can make it again this week. Thank you Sherry. You can count on it. Oh my gosh I know what I want for lunch now! Pinned! 😀 I’m so happy you like it, Susan! Thank you for pinning! Looks delicious! Thanks for sharing at Fiesta Friday! Oh Jas! I am like your husband… I can eat shrimps every day also. To be realistic I like all seafood! Your recipes are so ideal for me. I think that you live next door and I will come and join your table hahahaha! Thank you once more for sharing all these recipes!! Thank you much for contributing this recipe to The Beautifully Creative Inspired Link party. I can’t wait to see what you have to share next party! This one would make Bubba Gump proud indeed. I love the grilling idea. Being raised on the Gulf Coast of the US shrimp was a regular at our table. I’m with your hubby, I’ve never met a shrimp or prawn I didn’t like.